The Historic Lutheran Church in Westgarthtown (Thomastown), Melbourne, Victoria. Who would have guessed that in bustling Thomastown and Lalor, several historic buildings still exist representing German and Wendish immigration and settlement from the19th century? Westgarth town is named after William Westgarth, a Melbourne merchant who purchased 240 days of crown land in Thomastown for about 1 pound acre. He sold the land to 16 German and Wendish families. The village became known as Westgarthtown and was used for dairy land. This was the founding of Pura milk. There are seven stops on the historic walk which features farmhouses church and cemetery. Some are open to the public others you are privately owned and can only be viewed from the road. The historic walk around Westgarthtown is 2.9 km and only takes about 90 minutes. It featured on Coxy's Big Break on TV. This is the largest of the farmhouse in Westgarthtown built somewhere in the 1850s. The property has been restored and the walls surrounding it are all made of the Dry stone typical of this era. There are also sheds, a bathhouse, smokehouse and the garden how all classified under the Heritage Victorian Heritage register. The garden has been featured in the open gardens Australia program. Originally a bluestone farmhouse, the external walls were rendered and white washed around 1900.
farms comprising the two-storey Bluestone house, three outbuildings and stables. It is believed that this house is the oldest in Melbourne to have been owned by the same family continuously. The grandson of the original owners of this home started the Pura dairy at Preston. He originally started delivering with a one cart dairy to only a few local streets. This property comprises Barns, milking shed, tanks, a house and several large trees. It features the only genuine well in Westgarth town. Open to the public every fourth Sunday of the month at 2:30 PM and on special occasions. 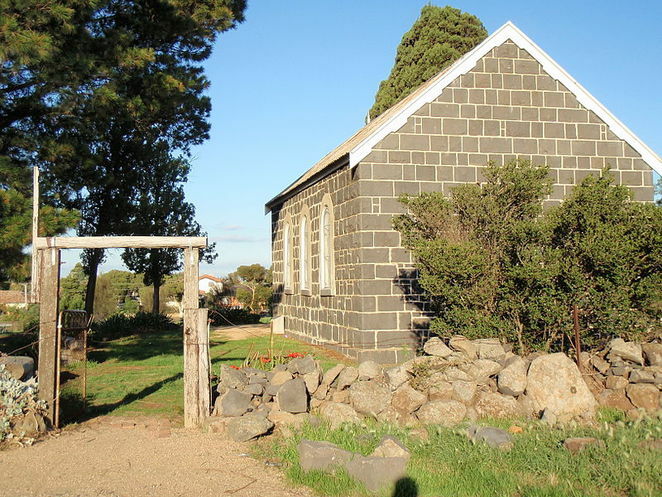 This is the oldest Lutheran Church in Australia that still operates. Services were conducted for a long time in German and then after the1900s in both German and English. Services are now conducted in English only. As it should be, this is the final resting place for the tour. Many headstones or in good condition and have inscriptions in both English and German. They leave evidence of the hard-working German life and history.